Here is a list of some of the most frequently asked questions we get about solar cooking. 1-Can a homemade solar cooker really cook food? 2-Are there risks of food borne illnesses possible with solar cooking? 3-Will a solar cooker kill harmful bacteria (pathogens)? 4-Is it safe to cook meat in a solar cooker? 5-How hot can a solar oven get? 6-What times of the year can I cook? 7-Can you use a solar cooker for canning or preserving? 8-I understand you can pasteurize or sterilize water with a solar cooker? 9-Why does the cooking pot have to be black or dark? 10-Why does one use shiny reflectors on a solar cooker? 11-Do I have to turn my solar cooker to track the sun? 12-Which style of solar cooker is best to use? 13-How long does it take to solar cook food? 14-How many kinds of Solar Cookers are there? 15-How can I learn to solar cook? 16-What else can a solar oven be used for besides cooking? 17-Why doesn't my solar cooker work well? 18-What are the best materials for building a homemade solar oven? I have heard about Hay Box Cookers, how do these relate to Solar Cookers? 20-Why do some people use a pressure cooker with a solar cooker? 21-Are Parabolic Solar Cookers really that dangerous? 22-Can you fry or grill with a solar cooker? 23-How many people in the US actually use solar cookers? 24-My child needs a Science Fair Project, would Solar Cooking work for this? 25-I am a Teacher or Educator, where can I find Curricula on Solar Energy/Solar Cooking? 27-Can you put frozen foods, such as meat, straight into a solar cooker? 28-Can you brown food in a solar oven? 29-How big can you build a solar oven? 30-Where can I find Adhesive backed reflective Vinyl? 31-How can I apply Adhesive Vinyl without ruining it? 32-Need tips and ideas specific to your style or brand of cooker? 33-Is it possible to solar cook in the winter time? 34-Can I cook when it is cloudy? 35-Can solar cookers be used in Hawaii with our weather? 36-Where can I find a Fresnel Lens? 37-Where can I buy a solar cooker in Mexico? ?Donde se puede comprar un horno solar en Mexico? 38-Is it necessary to use lids on your pans while solar cooking? * Where can I find comparison info. for the top solar cookers? Solar Oven Odor, Can you tell me about it? Need some help putting together your "Solar Burner" Parabolic? 1-Can a home made solar cooker really cook food? Some of your home made cookers may not be put together as well as a manufactured solar cooker but if the time and effort are taken to assemble a quality, well built solar oven you can cook any food you can think of. There are in fact some homemade cookers that are as well built as some of the commercial models and cook just as well or better. By following basic cooking and temperature guidelines you can easily solar cook food to the necessary temperatures that will kill harmful food borne bacteria. We highly recommend that you use a food or oven thermometer to gauge and determine correct food temperatures when cooking in a less controllable environment, this would include cooking over gas grills, charcoal grills, wood stoves or fires; and it is suggested even with conventional ovens, as do the professionals. If traditional food handling and cooking safety guidelines are followed and if suggestions and guidelines for using a solar cooker are followed, then it is possible to cook any variety of meat safely and deliciously. Most all professionally manufactured solar cookers are capable of reaching and sustaining the requisite temperatures needed for cooking meats and all other types of foods. And most, well built, home made solar cookers can perform the same task just as well, or better sometimes, than a commercially manufactured cooker. The best solar cookers can get as high as 600° F which is very unique indeed. Of course this is a unique cooker that can reach these temperatures. Solar cookers that reach these temperatures are highly specialized and very intricately designed parabolic cookers rather than a traditional solar oven. 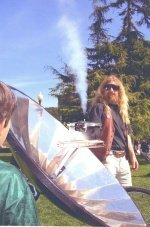 A solar oven is usually an enclosed box type cooker with or without the use of reflective panels. Some solar ovens will reach 400° F but most usually cook at temperature ranges between 250° F to 350° F, quite sufficient for cooking most foods. Panel cookers which are similar in principle, use a reflective panel to concentrate sunlight on a cooking pot that is usually covered by a plastic oven bag or glass enclosure to retain the heat. These can reach temperatures of 350° F and more (depending on food) and usually cook between 200° F and 350° F.
In many areas of the Southern United States and into the more tropical and arid regions of the world that have closer proximity to the equator you can cook year round; weather permitting. In the more northern states and countries such as Canada, Europe and northern Asia you will usually be limited to the summer time when the sun's trajectory is higher in the sky. For more info visit Solar Cooking Where? and Solar Cooking When? This is a great tool for outdoor enthusiasts and also for large parts of the worlds population that do not have access to clean water. Dark colors attract and retain the energy from the sun's rays better than light or shiny cooking pots. A dark colored metal pan will attain a far higher temperature than will a shiny aluminum pan in the same way that a light colored shirt will feel less hot than a black shirt. Lighter and shinier surfaces will only reflect the sun's rays away from the food. This is to accomplish the opposite effect of the above mentioned darkened cooking pot. The reflector panels are used to reflect (or concentrate) extra sunlight towards the dark or blackened cooking pot in order to convert the suns UV rays to heat, which in turn increase the temperatures within the pot and the food. The more of the suns rays that can be concentrated onto the cooking vessel and food the higher the temperatures that can be achieved. In order to achieve the maximum and most efficient cooking temperatures and capacities, you can adjust your cooker frequently to gain the extra advantage, but in general it is not necessary to do so. Most box cookers do not need to be re-positioned very frequently and panel cookers only slightly more often since the panel reflectors can shadow or prevent the sun's rays from reaching the pot when it is blocking the ray's path. Frequency of adjustment can also depend on the time of the year, summer being prime coking time and winter requiring more adjustment to the sun's trajectory in the sky. A parabolic cooker requires more frequent turning or track than do any of the other cookers in order to work more efficiently, but a parabolic can usually reach and maintain higher temperatures because of this. 12-Which solar cooker is best to use? Each type of cooker has its advantages and its disadvantages. If you like slow, low temperature cooking similar to a crock pot then you would probably want a box or panel cooker. If you want the ability to cook in a similar fashion to that of cooking over a conventional stove top or a campfire then a parabolic cooker works great. For baking, a box cooker would be your best overall cooker. For stews, soups and meats; a pot and panel cooker is great, and also a box cooker works fine for these foods. The combinations and possibilities are increased though when combining the features and characteristics of each type of solar cooker. The type of cooker you use will depend mostly on your needs and likes. Depending upon your food and the weather outside your cooking times will vary. A general rule of thumb though is that through solar cooking methods you can expect most foods to take about twice as long as opposed to traditional cooking methods. But as most practitioners of the art have discovered, much of the time cooking can be accomplished in equal or only slightly longer duration than traditional methods of cooking. As an example; on a mid summer day at midday on a cloudless afternoon you can do a casserole dish of home made macaroni and cheese from start to finish in about three to four hours; and that would include browning the sausage beforehand, cooking the pasta, combining all ingredients and then placing the whole mixture in a casserole dish and finishing the requisite cooking time indicated in the recipe directions. And every step and each ingredient can be done in a solar cooker. An egg can be fried in about seven minutes and white rice can cook up in about thirty minutes, just to give a few more examples. Cook times and duration can depend on many factors including the cooks themselves. Practice, experimentation, and time will produce more satisfactory results as you discover the pleasures of cooking with the power of the sun. Literally there are dozens of different styles, types and designs of solar cookers, but they can all be lumped into three basic classes of cooker. Many solar cookers have been designed using components, features and characteristics of each of the different classes in order to maximize the cooking capabilities and efficiencies which each feature may contribute to the cooker. Well, you can always "wing it", learn by trial and error as some do. Or you can research the information from books and the internet. The best way though would be to seek out a demonstration or a class being offered by individuals or organizations within your local community where you can gain some hands on experience and guidance from those who have practiced the art for awhile. These individuals are more than happy to share their abundance of solar cooking knowledge. See our Solar Class Locator page for information in your area. 16-What else can a solar oven be used for? 17-Why doesn't my Solar Oven work very well? There may be a number of reasons a solar cooking session may not have turned out well. Some reasons are more obvious and apparent than others. This is probably the biggest factor or number one reason for not getting good results. The best thing you can do when solar cooking is to start as early as possible in order to have sufficient time, which will ensure your taking advantage of the optimal hours. Do not worry about overcooking or burning most of your foods, it is very difficult to do so. Only with some of the "baked" items do you need to concern yourself with "over cooking", most of these can be cooked in short periods, therefore you should not leave these all day as you would with soups, stews, meats etc. Too much food was being cooked at one time; there were too many pots at a time. Overloading your pots and pans with too much food can affect how your food will cook. The more food you have the longer you need to allow it to cook and the more ideal should be your sun conditions. The best way to cook larger quantities is by putting smaller amounts of food into additional pots, but you can also overload a solar oven with too many pots also. Some cookers will not allow for too many pots at one time. There are many people who will use two or more solar cookers in order to handle larger quantities and for faster cooking results. There are many people who get the idea from others that all you need to do is set the food out in the solar oven and it will cook on its own. To a degree that can be true, but, just like regular cooking methods, some hands on involvement is needed in order to take maximum advantage of the sun's energy. It is suggested that you orient your solar cooker (track) towards the sun every hour or two in the summer time and every half hour in the winter time in order to allow it to receive the sun's rays more directly. For summer time cooking, many people have related that they can set the solar cooker facing at an optimal or select point and leave it for up to five, and as much as eight hours, to cook on its own with great results. This is true in many cases but will depend much upon the kind of food, atmospheric and geographic conditions and locations, as well as the style and quality of the cooker; that being said, you will assuredly obtain better results overall if you involve a bit of human intervention on your part by turning the cooker every so often. The oven loses heat too quickly due to holes or gaps in the seal of the cover or window. These factors can decrease the efficiency of your solar cooker by as much as 60% and even more. The more that you are able to prevent heat loss; the more rapidly, effectively and effortlessly you will be able to cook all kinds of food using the energy of the sun. Insulation of the cooker can help to increase your heat retention, but many people lose more heat through holes and gaps than any other way. Ensure that your solar cooker is free of these and any other defects. *If you are using a reflective panel cooker and oven bags to cover your cooking pot, make sure that the bag is not worn out and also that the bottom of the pot is suspended above the bag, so as not to be resting on it. Any thing that will raise the pot off of the ground and allow for heat circulation beneath the pot will enhance the cooking effectiveness. ** When using a parabolic cooker you will usually not have an enclosure to trap the heat for cooking, most parabolas have higher heat intensity and will usually cook faster, therefore eliminating the need for a "green house like" heat retaining cover. Cooking effectiveness is determined more by adjusting the parabolic focus point to take advantage of the suns rays than by heat retention. The window or transparent cover is dirty. If a glass or plastic cover on a solar oven gets too dirty it can diffuse the suns rays causing them (rays) to lose their intensity. It can basically prevent the UV rays from even getting inside the solar oven. The reflector panels are dirty or too small. The rays are not able to sufficiently concentrate or focus toward the cooking vessel, in order to heat it and the food, when the reflectors are dirty. You should wipe down or clean your panels whenever they get dirty, or each time you cook. Also, if your reflector panels are too small and don't "capture" enough of the suns rays, this can reduce the effectiveness of your solar cooker and increase cooking time. The solar cooker was uncovered too often, allowing heat to escape. Solar Cooking, just like Crockpot (slow) cooking, does not function at peak efficiency when the heat is allowed to escape by frequently uncovering the cooking pot. It takes longer for the lost heat to be regained and then maintained if it is allowed to escape too often. Too much liquid was added to the food or pot, causing it to take longer to cook. With meats and vegetables it is not necessary to add liquids, these foods will cook just fine using the moisture they already contain. Adding liquid can increase the required cook time. Liquid should be added only to those recipes that absorb water, such as rice, grains, legumes, soups, stews, etc. Water is a medium denser than any fruit, vegetable or meat.It can substantially slow and delay the cooking process. The wrong kind, or color of cooking vessel (pot) is being used. Dark is the key feature or characteristic that should be considered when selecting a cooking container for your solar cooker, black being the ideal color for solar cooking. Light colored or transparent cooking vessels will almost always deflect the suns converted energy away, thus resulting in less effective temperature gain within the pot and the food. As everyone knows; wearing a black shirt outdoors on a bright summer day, one quickly finds himself starting to warm up quite rapidly. Dark, thin and shallow steel or aluminum pots, pans and cooking sheets are the best for quick heat gain, which in turn transfers more rapidly to the food being cooked. Cast Iron usually takes longer to heat, but once it has attained such will usually retain the heat for longer periods of time, thus keeping the food hot or warm longer after the cooking is completed. Cooking foods in a solar cooker at very high altitude can take longer as opposed to lower elevations, this is due to the reduced boiling point of the water in the food. *Water reaches boiling point more slowly at high altitudes. 19-I have heard about Hay Box Cookers, how do these relate to Solar Cookers? A hay box cooker works on the theory of "heat retention" cooking, which is very similar to solar cooking, yet a hay box can be used in conjunction with any type of fuel cooking such as; electric, gas, fire, etc. Hay box cookers are being used more and more with solar cookers in order to speed up the cooking process to allow for more solar cooked meals at a time... Please visit our hay box cooker page for more info. A pressure cooker helps to cook the food much quicker than can be achieved at regular cooking temperatures. Trapped pressure causes the heat to rise higher than under normal cooking conditions. Some solar cooks will also use blackened canning jars (bottles) with tightened lids in much the same way, thus achieving somewhat similar pressurized cooking results. Yes, a parablic cooker can be dangerous...if used improperly or carelessly. Just as you would with any source of heat generation or highly concentrated light there are precautions that should be taken in order to avoid injury to body and eyes. This would also be applicable to the use of solar box cookers and solar panel cookers as well. All solar cookers can get extremely hot; along with the containers used for cooking as well as the foods within them. More particularly, a parabolic cooker has to be adjusted more often in order to attain ideal or maximum cooking temperatures and results; which requires that a person physically attend to it more often. Also, when using a parabolic,the cooking pots are placed on top of a frame or plate and utilized in a similar manner as used when cooking on a regular gas or electric stove top. When using this method the person cooking is exposed to the cook pan and its hot ingredients as well as the concentrated heat spot generated by the parabola. Whereas with a box or panel cooker; the pots and food are placed inside the oven interior and then closed off to seal in the heat, thus diminishing the possibility of exposure to high temperatures and the possibility of being burned. ...Should this cause one to completely shun the possibility of using a parabolic cooker? It is always important though, to know of possible risks associated with any type of heating device. Having said that, I would favorably endorse having a parabolic cooker as the principal means of cooking using solar energy. But better yet, as one of a variety of cookers, which would cover all of your solar cooking needs and options. A parabolic cooker can be a very useful and practical tool for cooking more quickly and efficiently using only the power of the sun, and there are many who prefer this type of cooker over the other available styles of solar cookers precisely for this reason. With a little bit of practice and effort; you too will find just how good a parabolic solar cooker will work for your needs. Yes, you can with most of the solar cookers, but it is not as easily accomplished with box or panel cookers and is not achieved in the traditional stove top or burner methods. The best solar cooker for frying and grilling is the Parabolic Cooker. You can place and use a cooking pot or pan in the same traditional stove top method on the receptacle of the parabolic. And you can attain and adjust the heat levels more easily by simply adjusting the position of the cooker according to your cooking needs. A good parabolic can achieve the higher temperatures needed for this type of cooking. 23-How many people in the United States actually use solar cookers? It would probably be impossible to know exactly how many, but they do number in the several thousands and are found in each state of this country. The demographics range from part time or occasional cooks to full time, avid solar cooks, from all socioeconomic levels; who use a solar cooker for as much as 75% or more of their total cooking efforts. If you are interested in expanding your knowledge, or sharing it with others feel free to join with the group. Solar Cooking would be an excellet way to show the principles of passive solar energy or passive solar gain at work. In fact this is one of the more popular science projects that kids and parents elect to use because of the ease and simplicity in building a simple solar cooker for demonstrating the principles of solar ray conversion and solar heat retention. Either way you choose to go, the results for scientific experimental and demonstration purposes will be realized. Help your students, Elementary through High School, learn about solar energy, and solar energy application using solar cookers for theory and real world applications. We would like to recommend a great site sponsored by the Florida Solar Energy Center, based at the University of Central Florida. Solar Matters II: What's Cooking? -How can I compare the available solar cookers to know which one is best for me? Yes, you can. In fact it cooks very well doing it in this manner. Rather than passing through a long thawing period at room temperature to thaw your meat you can put it into a hot solar oven where the temperatures rise more evenly, yet are hot enough to thaw and start cooking your meat as it thaws. With four to six hours of long slow cooking, your chickens and roasts will be succulent and so tender that it will fall off the bone. Of course the day has to be ideal with lots of sunshine so that the oven can achieve and maintain higher temperatures. Some foods can be browned in a solar oven, especially in the hotter ovens like the Global Sun Oven (GSO). Wheat breads can brown to an great extent, just not quite as brown or with a hardened crust, as in a conventional oven; because solar ovens retain more moisture. Chickens and other meats inside of black enamel roasters can brown on top due to the high temperatures radiating through the lids. And cookies and other pastries can brown also, especially if left in too long; which can also cause them to dry out a bit. I guess you could build it as big as your materials would allow, but it may cause difficulties in moving it, the oven and reflector stability, and also where to store it etc. The larger the cavern of the oven the more ability you need in order to concentrate the rays of the sun, in other words you would need very large reflector panels, proportionate to the oven/box size. You would also need to make sure the oven/box was very well insulated in order to retain the heat due to it's large/spacious interior. There is a community size oven that is manufactured by Global Sun Ovens that would fit this description, called the Villager Sun Oven, but it must be recognized that it is a precision manufactured solar cooker designed to cook with more precision and efficiency. We have seen this question come up many times over the years in solar cooking forums from people who would like to build their own solar panel, box or parabolic cookers, but are having a hard time finding some inexpensive reflective material that is easy to use and that will also last for a while. Aluminum foil just wears out too easily and Mylar usually has to be adhered to the cooker using staples, nails, glues etc. Many are looking for an easy, quick, efficient and durable alternative. We are happy to announce that here on our site we now offer a 2 mil Self Adhesive Silver Reflective Vinyl at very reasonable cost to the consumer. If you would like some more information on this vinyl please visit our Reflective Vinyl page. -Need Some help putting together your "Solar Burner Parabolic? Sometimes it just helps to be able to see (photos) how something goes together and then it suddenly becomes clearer. 32-How do I apply adhesive reflective vinyl without ruining it? The best way to do this, according to the professionals, is to wet the substrate with a "water and very light soap concentration"; allowing you to move the vinyl around similar to the method used in putting up wallpaper. When you have the adhesive vinyl situated where you like, then you can use a rubber or plastic squeegee or painter's spatula to force the water out from under the vinyl and then you can allow it to dry and to adhere to the surface. 33-Need tips or ideas specific to your brand or style of cooker? We have compiled a page full of ideas, suggestions and more on how to get the most out of your particular solar cooker. Also you can add or contribute your own suggestions and helps on using a solar oven more effectively if you would like to do so. 34-Is it possible to solar cook in the winter? Yes, you can solar cook in the winter as long as you have sunshine, even if the temperature is below zero. Find out more on using a solar cooker in the winter time. 35-Can I cook when it is cloudy? Ideal cooking results occur when the sun is bright and uninhibited or unimpeded by clouds, shadows etc. Cooking can be accomplished though on days when the clouds are high and thin, but it may slow things down a bit, and one would be wise to start a little earlier than usual. Long, slow moderate solar cooking, such as with stew, chili, veggies etc. will do fine under less than bright skies if you allow more time. Solar Baking on the other hand will take longer and the temperatures will not be as optimum as could be, thus resulting in mixed outcomes with your baked goods. On very cloudy days, you would best not really start any cooking unless the reports indicated clearing later on. 36-Can Solar Cookers be used in Hawaii with our weather? The weather in Hawaii is actually quite sunny overall, but can have clouds moving through all day long; thus making it slightly challenging, but no more so than many other areas of the world. There are quite a few people who are solar cooking and have solar cooked for many years in Hawaii and on other island countries. Even in the dry Southwest, we still have to contend with clouds at times, but we still are able to solar cook even on partly to intermittently cloudy days. We get this question a lot...watch the video and then read further for information on where you can obtain such a lens for a "super concentrator solar cooker"
These lenses are hard to get a hold of but we have found a source so that you can purchase you own Fresnel lens. For those who would like to purchase a Fresnel Lens to make your own "concentrator cooker" you can contact Paul Lennon for details, cost, and shipping information on his product. Fresnel Lens order info. 38-Where can I Buy a Solar Cooker in Mexico? ?Donde se puede comprar un horno solar en Mexico? On this site you will find the best manufacturer and seller of solar ovens and parabolic cookers in all of Mexico. Ignacio Agraz makes very high quality solar cookers and has manufactured communications dishes as well for over 35 years. 39-Is it necessary to use lids on pans while solar cooking? No, it is not necessary, but I would recommend it. Less moisture inside of your oven chamber. Better heat retention, thus quicker cooking times in general for most foods. Reduces tendency of cooking foods to pick up other lingering flavors that may be present in your cooker from previous cooking sessions. In fact, I use a lid so that most of my foods will brown, such as chickens, roasts, lasagnas, pizza etc. * * Tip: A lid over a pizza or lasagna, enchilada etc. will allow the top of the food to toast rather than bleach white, which can happen when cheese is exposed to direct sunlight. and the skyrocketing and volatile state of energy costs such as electricity, oil etc. Solar cooking may just be able to help your own family's situation! Can you use a solar cooker for other things? You can purify water with heat. Does this provide enough heat to do that? Can you melt things with it? etc. What kind of eye protection is recommended when using a solar cooker? Can I use Cast Iron on/in a Solar Cooker? Can You solar cook from a window? what is maximum degree for solar cooking box reflector to be effective? Does condensation on a solar oven lid affect the cooking time? Are there any ideas in investigation projects about solar cookers? why does a solar oven need a plastic cover while cooking? Where are solar cookers used? I'm using two satellite dish in my solar cooker, in order to achieve maximum temperature what should be angle between reflector.